Israeli PM Netanyahu and Indian PM Modi meet Moishy Holtzberg in Israel. 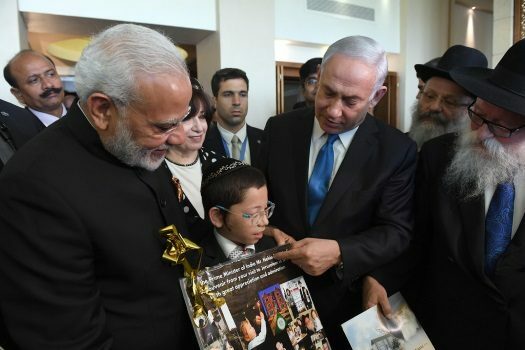 Moishy Holtzberg, whose parents Rabbi Gavriel and Rivka Holtzberg were murdered in the 2008 terror attack on the Indian city of Mumbai’s Chabad House, will travel to India with Israeli Prime Minister Benjamin Netanyahu in January. Netanyahu is slated to arrive in India on Jan. 14 for a five-day trip. Moshe’s grandfather, Rabbi Shimon Rosenberg, will join his grandson and the prime minister on the trip. “Moshe is very excited to return to his parents’ Chabad House,” said Rosenberg. In the Mumbai attack, which was carried out by a Pakistani Islamic terrorist organization as part of a larger siege on the city, six people were killed, including Moshe’s parents. Moshe, who was 2-years-old at the time, survived due to the heroics of his Indian nanny Sandra Samuel. Now 11, Moshe was sent to live in Israel with his grandparents and nanny, who was given Israeli residency and earned the country’s “Righteous Among the Nations” honorific for non-Jews. 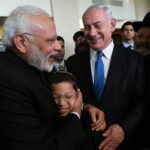 During his visit to Israel in July, Indian Prime Minister Narendra Modi met with Moshe and described it as “an emotional moment.” In that same meeting, Netanyahu promised that Moshe would accompany him during his future trip to India. Earlier this month, Housing Minister Yoav Galant announced the Israeli government’s decision to gift a state-owned apartment in Beitar Illit to the Holtzberg family.